This site gives a brief perspective of the acquisition, research and restoration progress of this 1925 Wilhelm Bruder and Sons organ. Most are 1980's Play-Rite recuts. $50.00 each plus shipping. $40.00 each plus shipping when you buy 4 or more. If interested in a roll please email Sam the roll numbers. 30 rolls have been sold. The rolls remaining are listed below. NOTE: The above is the tune order when the roll was issued as the "Overture Special" roll; when issued as roll 6528/6537A, the tunes were in the following order: 3, 1, 2. ROLL NUMBER 6524 "Cuban Danzon"
* Late recuts have the B.A.B. arrangement of the fox trot "Amapola" (Joseph M. Lacalle)(Dec 15, 1924) substituted as tune 1. 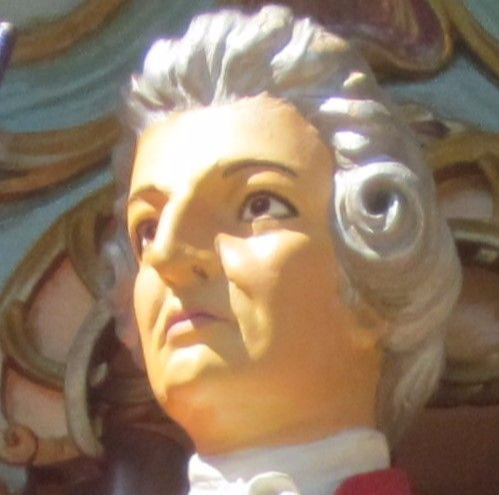 Although "Los Matrimonios, Salvavidas" has not survived on any known roll, Chris Carlisle, proprietor of the musical website www.bandorganmusic.com, has a recording, made by his grandfather Paul Eakins, of the missing tune as played on a 157 band organ. Click here to hear that recording. NOTE: Most, perhaps all, of the tunes on this roll have note-for-note interpolations from other Wurlitzer 165 tunes in them, such as phrases from "Beautiful Ohio" in tune 3, "Ja-Da, Ja-Da, Ja-Da" in tune 7, "On Miami Shore" in tune 8, "Chong, He Come From Hong Kong" in tune 10. The other tunes where interpolations have not been recognized may still contain them, taken from other, lost Wurlitzer rolls. For example tune 6 contains passages that sound exactly like phrases from "Ecos de Lisboa" (by Goris & Aceves?). ROLL NUMBER 6809 "American Marches"
ROLL NUMBER 6810 "All Sousa March Roll"
* The original tune list of roll 6530 is unavailable to verify the composer credit. Eight marches were written for the Seventh Regiment, and only the one by Neyer has the title as given. Sousa cannot be the composer because roll 6530 was issued before he composed his march for the Seventh Regiment. ROLL NUMBER 6813 "Strauss Waltzes"
NOTE: This roll is probably an attempt to reconstitute original B.A.B roll 014, but with two changes.